Reviewing classics that live up on a pedestal somewhere can present a problem to a lowly blogger like me. What can usefully be added to the discussion of a book so widely studied, taught and revered that hasn't already been said? Perhaps more usefully I can say more about my experience as a reader. A book can be all of the things I have mentioned above and still not necessarily be a knockout experience for the first-time reader. I have, I am aware, told this story in a very rambling way so that it may be difficult for anyone to find their path through what may be a sort of maze. I cannot help it. I have stuck to my idea of being in a country cottage with a silent listener, hearing, between the gusts of the wind and amidst the noises of the distant sea, the story as it comes. And when one discusses an affair - a long, sad affair - one goes back, one goes forwards. One remembers points that one has forgotten and one explains them all the more minutely since one recognises that one has forgotten to mention them in their proper places and that one may have given, by omitting them, a false impression. I console myself with thinking that this is a real story and that, after all, real stories are probably best told in the way a real person telling a story would tell them. They will then seem most real. Coming three quarters of the way into the novel, the paragraph above goes some way to explaining both its triumph and the frustration for this first time reader. 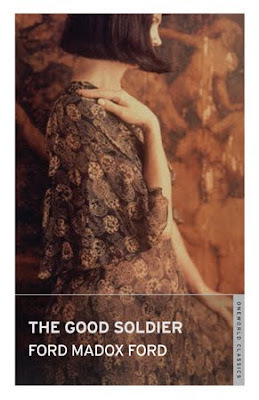 The Good Soldier is a masterpiece of plotting and structure, using the non-linear narrative of memory to reveal its secrets much like a superior crime-thriller. Beyond that it has the very definition of an unreliable narrator, John Dowell flitting back and forth in his story, contradicting himself and changing sympathies. We know from the outset that two of its main characters will wind up dead; this is, as the first line tells us, 'the saddest story I have ever heard' (Ford's preferred title for the book was 'The Saddest Story') but Ford takes his time in revealing to us exactly how that comes about and I'll admit that I found the first 50 pages or so to be quite a slog. Permanence? Stability? I can't believe it's gone. I can't believe that long, tranquil life, which was just stepping a minuet, vanished in four crashing days at the end of nine years and six weeks. Upon my word, yes, our intimacy was like a minuet, simply because on every possible occasion, and in every possible circumstance we knew where to go, where to sit, which table we unanimously should choose, and we could rise and go, all four together, without a signal from any one of us, always to the music of the Kur orchestra, always in the temperate sunshine, or, if it rained, in discreet shelters. No, indeed, it can't be gone. You can't kill a minuet de la cour. John and his wife Florence meet English army captain Edward Ashburnam (the good soldier) and his wife Leonora at a German spa in 1904. They seem to be two perfect couples and their acquaintance for almost a decade, as the paragraph above indicates, as effortless as a dance together but for almost all that time Edward and Florence have been conducting an affair whose revelation begins a cataclysmic breakdown that ends in more than one death. Rather than focusing on the plot, structure and stylistic influence, which have been covered satisfactorily I'm sure by creative writing students the length and breadth of the country, I want to mention the characterisation which was particularly impressive, Ford rather brilliant at highlighting a singular trait to illustrate an entire character. Here for instance one of our first impressions of Edward. I had forgotten about his eyes. They were as blue as the sides of a certain box of matches. When you looked at them carefully you saw that they were perfectly honest, perfectly straightforward, perfectly, perfectly stupid. But the brick pink of his complexion, running perfectly level to the brick pink of his inner eyelids, gave them a curious, sinister expression - like a mosaic of blue porcelain set in pink china. And that chap, coming into a room, snapped up the gaze of every woman in it, as dextrously as a conjuror pockets billiard balls. A hint of disgust in the physical description before that final sentence that reveals the envy, perhaps even admiration, of our narrator. The physicality of characters is incredibly important; from the outset we are aware of course that two of the principal characters have 'a heart', the reason for their sojourn in a spa. But in a story where the physical expression of love is either withheld, as in the case of the Dowell's who are kept separate by the fear of what the strain might do to poor Florence, or secret, as with the various infidelities, the smallest details of physical language can become important. In one description of Leonora there is again a devastating final sentence, one that sounds cutting at first but could even be read as sympathetic, once we have had certain revelations later in the book. Certain women's lines guide your eyes to their necks, their eyelashes, their lips, their breasts. But Leonora's seemed to conduct your gaze always to her wrist. And the wrist was at its best in a black or a dogskin glove and there was always a gold circlet with a little chain supporting a very small golden key to a dispatch box. Perhaps it was that in which she locked up her heart and her feelings. John's seeming perceptiveness should be read in the context of confusion that pervades the novel. He is always at least one step behind, often many more, and the biggest mystery in his life is his own wife. Treated for so many years as an object in need of care and protection, the sudden realisation that she is something else entirely is something he struggles to comprehend even with the privilege of hindsight, only managing to deduce that 'the mainspring of her nature must have been vanity.' My own struggles with the early pages of the book were more than compensated for by the time I finished it and with such a swirling narrative I'm sure that further readings would reward, surprise and satisfy. Unlike John Dowell we could all benefit from hindsight. I love the idea of that alternative reading, Rob. The unreliable narrator makes it ripe for an analysis like that. It's a book that seems perfect for teaching, so rich in possible interpretation and so impressive structurally. I'm so glad to have finally got around to reading it. I actually haven't read this nor heard of it (I wonder how I could have missed it, actually) but it has definitely been added to the list. It's a classic and well worth having on the list, likeglass. I'd love to know your thoughts when you get round to it.